With draft season right around the corner, a look at where several notable players are being taken will help you prepare for reading your league's owners. We’ve been talking, writing and debating about fantasy football for months, but now that we’ve reached the middle of August, draft season is finally right around the corner. With that, it’s time to start checking in on shifts in average draft position with the season debut of the ADP Watch. Every Wednesday until the start of the regular season, we’ll check in on the most interesting ADP changes across the fantasy world. Players will continue to rise up and fall down draft boards, and it’s important to have a handle on the typical draft-day landscape before you sit down to build your team. ADP is not gospel, but rather another club in the skilled drafter’s bag. You should not assume that every player will go exactly at, or even right around, his ADP in your draft. Understanding ADP, however, is crucial to making the decisions that help you find excess value throughout your draft, from Antonio Brown and Odell Beckham Jr. all the way to Terrelle Pryor and Tim Hightower. We’ll kick off our first ADP Watch with a look at three pairs of intertwined players. First up: the four-game suspension crew. Bell and Gordon will both miss the first four games of the season due to violations of the league’s substance abuse policy. Of course, that was terrible news for the former, and excellent for the latter. Their ADP shifts over the last few weeks have reflected those realities. Bell was locked in as a top-five pick earlier in the summer before the league office announced his suspension. His stock took an immediate hit, but it has leveled out at the end of the first round. Bell now has an 11.5 ADP, which makes him a late-first or early-second round pick in a typical draft. His ADP hasn’t budged for the last three weeks, so it’s safe to assume that’s the sort of draft capital you’ll have to spend to get him. As great as Bell is, that’s a steep price to pay. Even if he is the No. 1 running back in terms of points per game, you could dig yourself a hole by playing without your first-round pick for a month. He may not do you very much good if you’re 1–3 or 0–4 when he returns. Consider, too, that by taking Bell you’re passing on another top-15 player like Allen Robinson, Rob Gronkowski, Jamaal Charles or Dez Bryant. Would you rather have one of those guys for 13 fantasy regular season weeks, or Bell for nine? Gordon, conversely, has seen his ADP skyrocket since being reinstated, even with the four-game suspension looming. Before he was given the green light to play this season, he was no more than a late-round flier. That changed instantly upon his reinstatement, with his draft stock climbing day by day. It has settled in the middle of the sixth round, with Gordon sporting a 64.1 ADP. If you’re in the market for receivers, consider that you’ll have to take Gordon ahead of Emmanuel Sanders, John Brown, Jordan Matthews, Tyler Lockett and DeVante Parker in a typical draft. Consider, too, that Gordon was terrible when we last saw him in 2014, and that he hasn’t played a football game in 20 months. At this price, I’m always going to let someone else be the believer in Gordon. Two sets of Florida-based running back teammates are up next, starting in the northern part of the state. Something interesting is happening with Ivory and Yeldon that, I believe, comes across more strikingly in graph form. 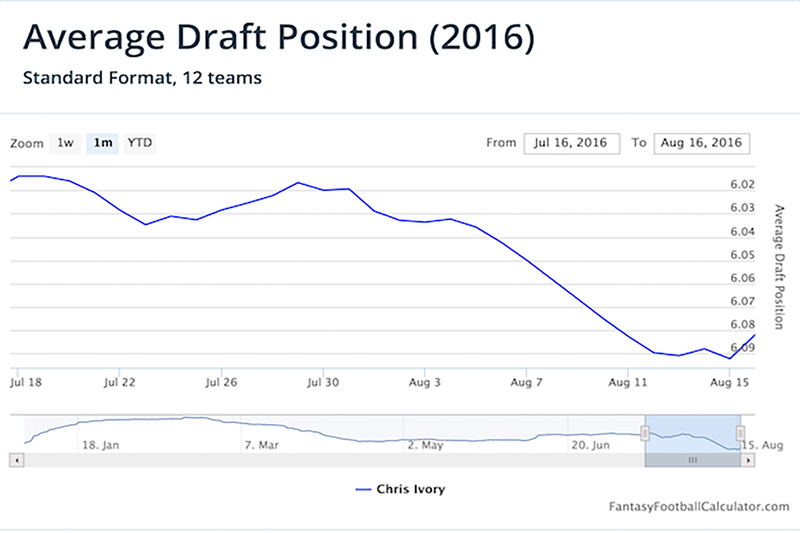 Typically, the draft stocks of running backs on the same team have an inverse relationship: As one’s dips, the other’s rises. Drafters are souring on both Ivory and Yeldon, however, as we get closer to the true beginning of draft season. Both have lost nearly a full round off their ADPs, with Ivory falling to the end of the sixth and Yeldon slipping to the end of the eighth. This would seem to have at least a little something to do with the Jacksonville passing game, and indeed, both Allen Robinson and Allen Hurns have moved up the ADP charts over the last month. Still, it would seem that fantasy owners are missing an opportunity with at least one of the team’s backs. 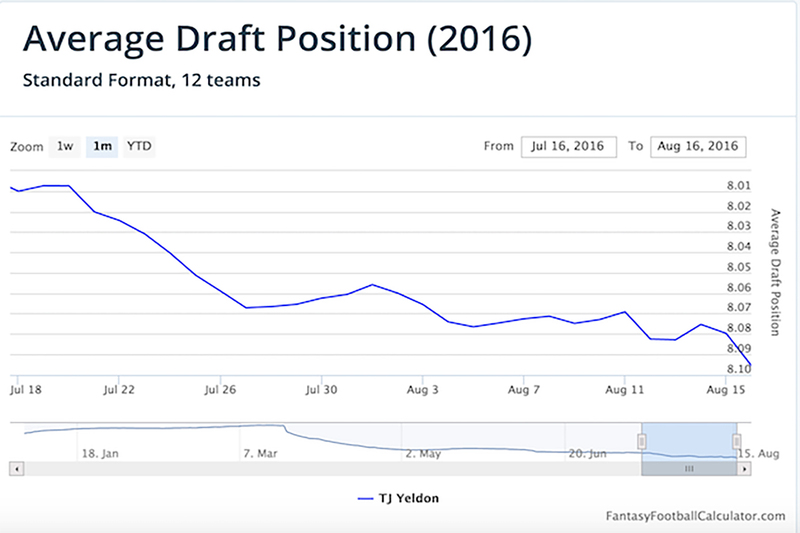 I’m already on record as being a fan of Yeldon at his ADP. You can read why in last week’s roundtable, but I’ll say here that his receiving ability plays well in the Jacksonville offense. The Jaguars may want to slow things down a bit this season, especially if they’re more competitive than they were a year ago, but Yeldon ran better last season than most fantasy owners remember. I wouldn’t want both of these backs on the same fantasy roster, and Yeldon is the more intriguing play. 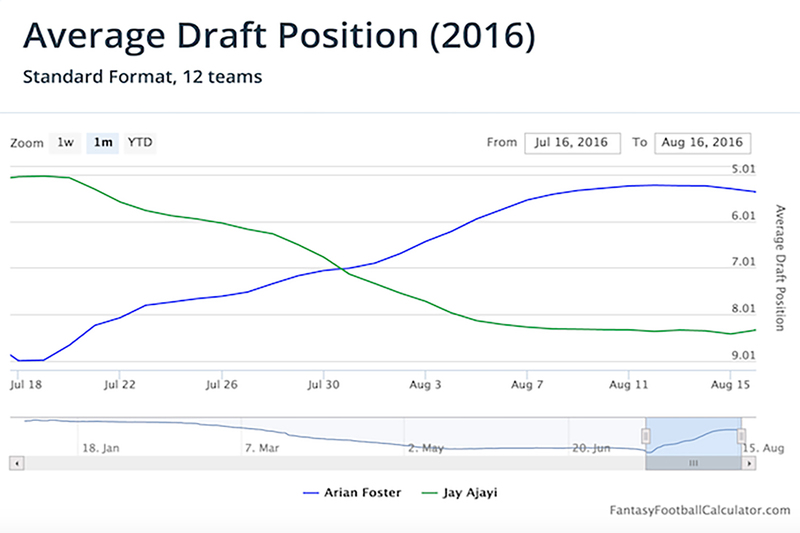 The Foster-Ajayi relationship has created another ADP graph that you just have to see, this time with both players on the same plot. The Dolphins signed Foster on July 18. It took less than two weeks for him to surpass Ajayi in ADP. While both seem to have settled into their appropriate ADP, it’s entirely possible their stock continues to diverge in the coming weeks. Quite frankly, it’s hard to imagine Ajayi having a meaningful role any week in which Foster is healthy. The only question, then, is whether you trust Foster to stay upright. Fantasy owners must budget at least a handful of missed games for the oft-injured running back. At the same time, Foster was sixth in points per game among running backs before rupturing his Achilles last year. That makes him the ultimate high-risk, high-reward pick this year. If he’s healthy for 12 games, his owners will have a likely RB1 at an RB3 price. If he’s healthy for, say, six games, he won’t return a profit while carrying an opportunity cost equal to the likes of Eric Decker, Donte Moncrief and Ryan Mathews. As for Ajayi, the only person who should even consider him at his ADP is someone who has already drafted Foster. You’ll never play him when the latter is healthy. Hill has moved steadily up draft boards over the last month, improving his ADP to 44.2 from 53.5 over the last month. Even just one week ago he was still coming off the board at the beginning of the fifth round, but has continued to trend more expensive, and could be in the middle or start of the fourth round by the time August ends. Hill’s rise is perfectly understandable. He disappointed fantasy owners last season but still has 20 touchdowns in his first two years in the league. Despite falling short of 900 yards from scrimmage last year, he was the No. 14 running back in standard-scoring leagues and scored at least 12 points eight times. Even with Hue Jackson gone, Hill should retain the same role in Cincinnati’s offense he has had the last two seasons. He and Giovani Bernard are truly symbiotic, and both carry RB2 potential this season. Hill may not be a fun pick, but he’s appropriately priced at the end of the fourth round. Jones has been one of the fastest climbers over the last week, improving his ADP by a full round since Aug. 10. Way back then, you were able to get him at the start of the ninth round in a typical draft. Now you’ll need to use a late-seventh or early-eighth rounder to secure his services. Jones has turned into a chic pick in industry circles, and that’s starting to trickle down to the populace at large. No one can replace Calvin Johnson, but Jones will be asked to do a lot of the deep-ball heavy lifting for the Lions. He was stuck behind an obviously superior receiver during his time with the Bengals, and that’s not the case in Detroit. Golden Tate is the better player, but the gulf isn’t nearly as wide as the one that Jones needed binoculars to see past to find A.J. Green. In fact, it’s likely that Jones has more touchdown upside than his fellow starter for the first time in his career. He was a steal in the ninth round. He’s merely a fair-priced receiver in the late seventh or early eighth. The Giants’ running game was a trainwreck last year, constantly bouncing from Jennings to Andre Williams to Shane Vereen to Orleans Darkwa and back again, never really letting any one back get into a rhythm. Jennings was, and still is, clearly the best runner of the bunch, and new coach née offensive coordinator Ben McAdoo seems determined to not make the same mistake again this season. Jennings will be the team’s feature back this season, eating up the vast majority of the carries while Vereen serves primarily as a pass catcher. As ugly as the overall rushing attack was for the Giants last year, Jennings picked up 4.43 yards per carry, totaling 863 yards on 195 totes. The news of Jennings’s status has resonated in the fantasy community. At the start of August, a drafter could reliably get Jennings early in the eighth round. You need to act a full round earlier, now, and this ADP continues to trend upward. Volume is a running back’s best friend, and it appears Jennings will have that this season. That’s more than half the battle for a running back in his ADP range, as well. Jennings is a good bet to turn a profit for his owners this season. There has been no shortage of columns on SI.com this summer highlighting Gordon as one of this season’s prime bounceback candidates. Make no mistake, it is becoming cool to like Gordon. Just remember that we’ve been here for a long time. Gordon will now cost fantasy owners an early-sixth round pick in a typical draft, a significant reversal from earlier in the summer when you could practically steal the second-year player. His stock first started to increase amid glowing reports coming out of training camp. That, of course, should be taken for what it’s worth. The Gordon ADP hype machine kicked into full gear just as he did the same when scampering for a 44-yard touchdown reception in the Chargers’ preseason opener. We don’t need to go over the litany of things that went wrong in San Diego last season and hurt Gordon, even though he had no way of preventing them. He has the pedigree to be a star in the league, and no one really standing in his way with Danny Woodhead’s role clearly defined. Gordon is going to make a lot of people look smart this season. Just like volume is going to make Jennings a worthwhile pick at his ADP this season, so too will it keep Gore’s career as a fantasy mainstay chugging right along in year No. 12. At no point this summer has Gore cost fantasy owners a premium pick. His price started out early in the sixth round and has fluctuated between there and a full round later, settling for now in the middle of the sixth at an ADP of 67. Gore will be, without question, one of the most boring picks made in every draft this season. Still, take a look at that running back depth chart in Indianapolis. Who’s going to take carries away from him? Josh Ferguson? He’s an undrafted rookie out of Illinois, and he’s likely the most intriguing player behind Gore. Robert Turbin? Jordan Todman? Please. This is Gore’s show. Gore may be 33 years old, but he hasn’t missed a game since 2010 and has held up while getting at least 255 carries in each of the last five seasons. It would be an absolute shock if he didn’t volume his way to an RB2 season.